Balatonalmádi is a popular resort town in Veszprém county, in Hungary, with a population of 8,500, situated on the northern shore of Lake Balaton. 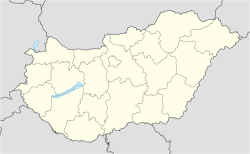 The town developed from three previously separated villages, which were united by combining Balatonalmádi and Káptalanfüred in 1952, and Balatonalmádi and Vörösberény in 1971. At its beginnings, the settlement was called Almádi, and later Almádi-puszta, and belonged to the vineyard located on the current city centre. The vineyards were destroyed in the end of the 1800s by phylloxera. There is a unique Calvinist church. Around the church there is a special stonewall. Not far from here there is a Catholic church, which was built between 1977–79. Inside there are frescoes. On the other side there is a building from the 18th century. Under this building there is a huge cellar where a wine house and wine museum will be opened as well. The village of Vörösberény existed already during the Hungarian conquest. King Stephen I donated it to Greek nuns inhabiting Veszprém Valley, according to the first charter in Greek containing the settlement's name. The first summer season started officially in 1874. Almadi summer festival starting from June to September every weekend with special programmes. The growth of Balatonalmádi was quickened by the opening of the railway in 1909. Balatonalmádi is a well known tourist destination in Hungary due to its attractive location. Wikimedia Commons has media related to Balatonalmádi. ^ "Balatonalmádi települési választás eredményei" (html) (in Hungarian). Nemzeti Választási Iroda. 2014-10-12. Retrieved 2016-02-18. This page was last edited on 23 March 2019, at 18:33 (UTC).